Mon., Jan. 14, 2019, 4 p.m. Chilly weather and soup go hand in hand – so it’s fitting that January is National Soup Month. To celebrate, I’m sharing one of my favorite winter warmers: chicken and wild rice soup. 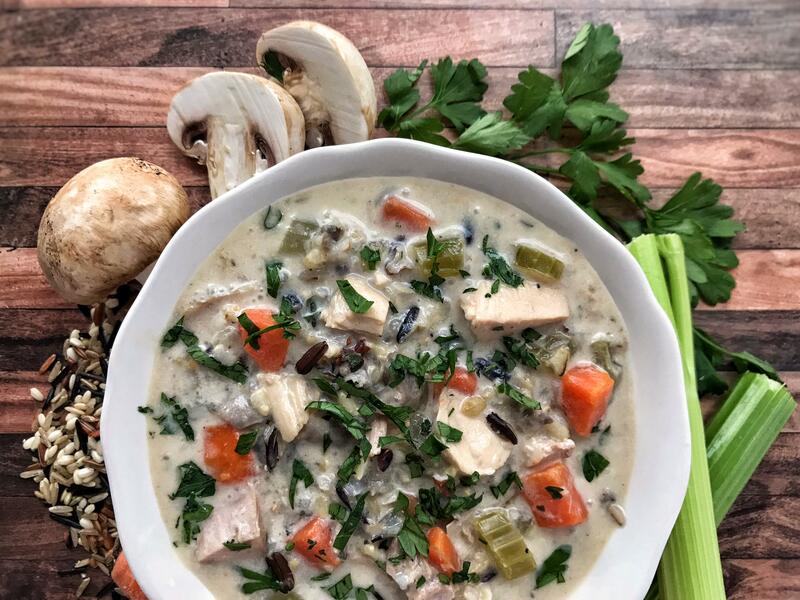 This lightly creamy soup is hearty, filled with veggies, tender chicken, and nutty wild rice. And besides some time for simmering, this one pot meal comes together quite easily. Celery, carrots, mushrooms, onions, and garlic are combined with seasonings and sautéed until softened. Wild rice, chicken stock and water are added and simmered for a bit before adding chunks of roasted chicken. Next, you stir in the cream, lemon zest, and add a few shakes of salt and pepper to taste. Now I hope you’re hungry, because delicious bowls of pure comfort are just a ladle away. I top mine with a sprinkle of fresh chopped parsley and serve it with a buttered up slice of crusty French bread. It goes great with salad, too. Spinach or kale would be a nice addition to the soup, and turkey can be used instead of chicken. Also, to cut down on cooking time, you can use already cooked or quick-cooking wild rice. Heat butter in a large pot over medium-high heat then add in celery, carrots, mushrooms, onions, garlic and thyme and a generous pinch each of salt and pepper. Cook, stirring occasionally, until the vegetables just start to soften, about 10 minutes. Sprinkle the flour over the vegetables and toss and cook until evenly coated and lightly browned, about 3 minutes. Add the wild rice, chicken stock and water to pot. Bring to a boil, then reduce heat to low to simmer, stirring occasionally, until the vegetables are tender, about 30 minutes. Add the chicken and continue to simmer until the wild rice is tender, 15 to 20 minutes longer. Stir in the cream, lemon zest and season to taste with salt and pepper. Serve hot and garnished with chopped fresh parsley. An earlier version of this recipe neglected to include the mushrooms in the directions. They should be sauteed with the other vegetables. The recipe has been updated. Published: Jan. 14, 2019, 4 p.m.